Fusion RA-55 Marine Stereo | Peninsula Marine Ltd.
Fusions most compact marine stereo yet, the MS-RA55 provides a clear and dynamic sound in a marine sealed and space saving design. 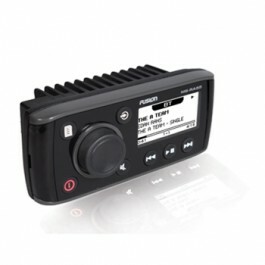 With Bluetooth audio streaming built-in, users can stream their music from any compatible device directly to the RA-55. Featuring a sleek front face with shallow mount design, the RA55 fits nicely into smaller boats, tenders and anywhere where available space may be an issue.